So, let’s get this out of the way: I am NOT playing an MMO. That is the quickest way to not get anything else done this year, and I am going to try to get things done this year. But. My wife was talking about some older MMOs she kind of missed, and mentioned that she wanted to give LOTRO another try but had heard that it was owned by a new publisher now and was worried that she would log in and find that all of her characters and stuff were gone. So, I volunteered to check it out on my account, since I didn’t have a ton of attachment and wouldn’t be devastated if I found out that everything was missing. Anyway. I let Steam download the client, and dug up my old login info, got to the server list, and realized that I had no idea where to go. The game launcher recommended “Crickhollow”, so I logged on to that server and was greeted with an empty character list. 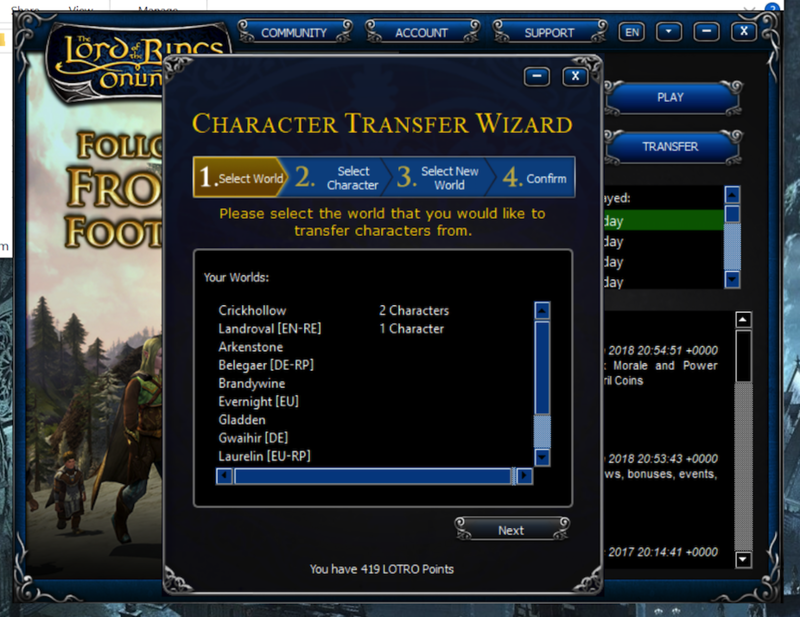 I did a few quick searches, mostly of the form “How do I find my lotro characters” and found that not knowing where your characters had gone after recent server consolidations was a pretty common complaint – and that the commonly-accepted solution was to log in to the client and press the “Transfer” button, which would bring up a list of all the servers in the game, even the decommissioned ones, and allow me to get my old characters to a currently-active server. This actually isn’t a weird problem – it’s a kind of bug that I used to consider almost a “freebie” back in my software QA days, because it just means that the program you’re using wasn’t designed around Windows font scaling. 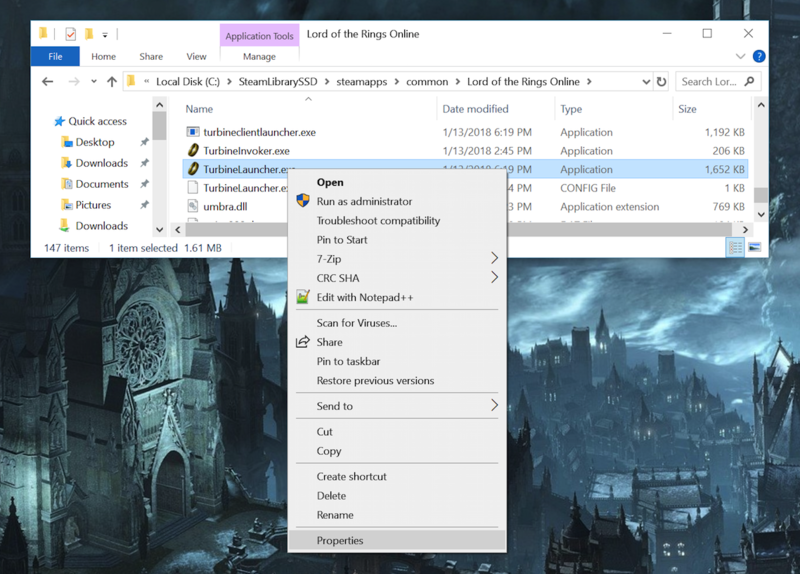 Font scaling (“Large Fonts” in older versions of Windows) USED to be an accessibility option for people with impaired vision, but it’s damn near a necessity with high-DPI displays. Any modern program should handle font scaling, but LOTRO is not very modern and I don’t expect Daybreak will be putting a single penny in to it that they aren’t forced to. So, I went into Control Panel, and turned the font scaling down to 100% (from 150%) and assumed that the problem would be fixed. It wasn’t, so I next tried lowering my desktop resolution to 1920×1080. I still had the unusable transfer window. I went back to searching, with a frustrating lack of results, eventually finding someone suggesting that I needed to override the font scaling options on the application level. 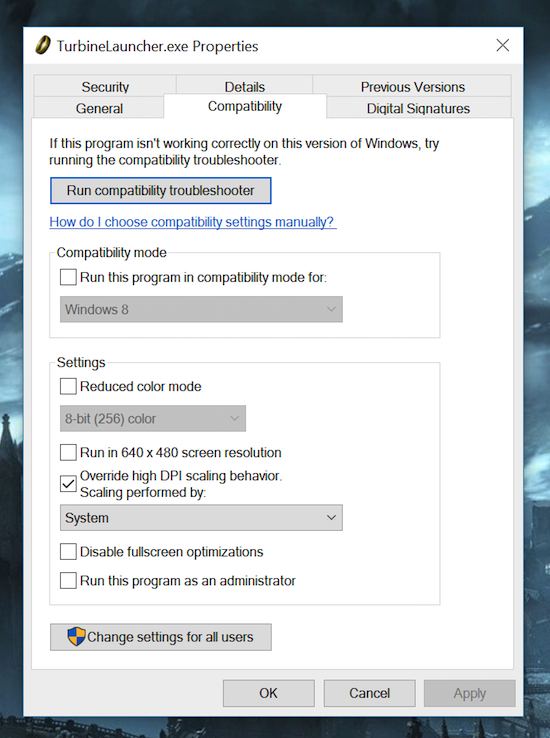 One you’re here, check the box for “Override high DPI scaling behavior” and choose “System” rather than “Application”. Anyway, I was able to find my characters on their old server, transfer them to an existing live server (it took less than 5 minutes), and then log in and find them waiting at the character select for me. Then I closed the game, because I cannot get sucked into an MMO right now. Still, if I feel the urge to run around and beat down some orcs, I have that option now… and, with any luck, my few minutes of frustration will come in handy to someone else in the same boat of staring at a blank character screen and wondering where their hours and days of progress disappeared to. As an aside, this seems to be limited to Windows 10. I tried the Turbine Launcher on Windows 7 with no problems, and I’m going to bet that the Mac version is smart enough to deal with font scaling considering it’s of much more recent vintage. So, this issue is probably limited to the very small set of people who are good at keeping up with the latest Windows versions but for some reason have nostalgia for a mid-2000s MMO. Funny, I just spent several hours tracking down my Final Fantasy XIV Online character after about 5 years – and finally found it! 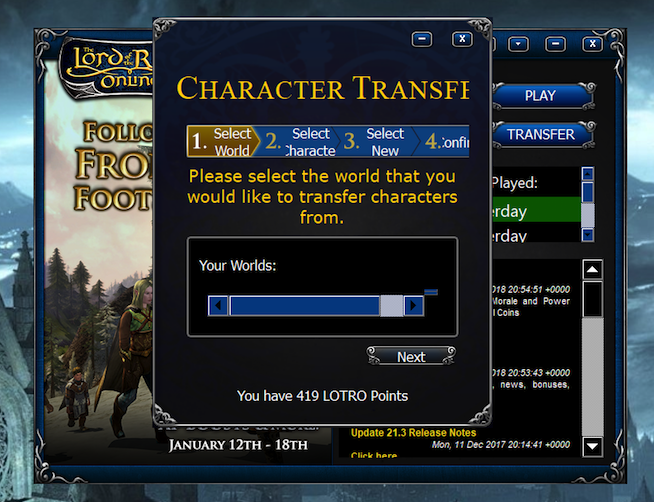 I don’t know if LOTRO has online character trackers, but FFXIV had lots of fan sites as well as an official one. These sites are also heavily cached and so finding old versions of the site using things like WaybackMachine is a pretty effective method to finding it. LOTRO is a weird case because it’s been sold a couple of times and most of the online resources are really dead. I’m not actually sure how they’ve managed to hold on to the license! I’m staying clean, though. My wife discovered there’s a new class she can play that turns into a bear in combat, so well… I make sure she has food every few hours. It does have the serious advantage of having a storyline that you can finish. I was hooked on it for some months until finishing Heavensward, and for some reason seeing the credits roll on that was enough closure to put down my bow harp thing.